One of the most common questions and misconceptions clients have when it comes to screen printing is that they will be able to get a “sample” print before their entire run is printed. While rules are made to be broken I can guarantee that almost every screen printing company in America will not print you a sample without charging you a fortune and here is why. To understand why screen printers can not print samples is to first understand the screen printing process. 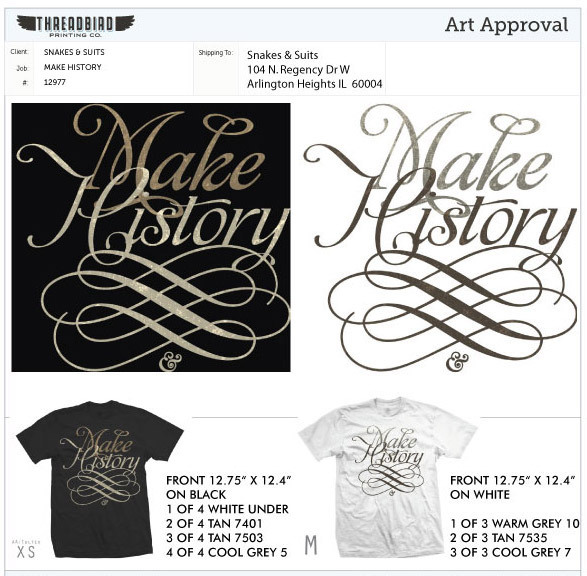 First thing you must take note of is that screen printing is indeed a “process” that involves several steps before your t-shirt can come to life. While I am not going to go into deep details here are the basic steps for the screen printing process. 1. Preparing art for print: Art is separated by color into different layers. This is done because with the screen printing process each color in a design requires a separate screen. For example a five color print will require 5 different screens which layered on top of each other will form the final image. 2. Films: While not all screen printing companies use photo emulsion, a lot of them do and here is the process. Basically the original image is transferred onto an overlay such as acetate, usually by photocopying. This is once again done for each layer in the design. 3. Screens: Each piece of photocopied acetate is then burned onto the emulsion covered silk screen using ultraviolet light. The areas that are clear harden the emulsion. After this the screens are washed and the areas of emulsion that were not exposed to the light get washed away leaving you a negative of each layer of the artwork. 4. Printing: Each screen is then attached to the printing press where each layer/color is laid down individually by squeegeeing ink through the screen and onto your tee. This is done for each layer until you have your final image. 5. Drying: After all layers have been laid down on top of each other and the final image has been created, each tee is sent through a high powered dryer to cure the ink and form your final product. As you can see even when breaking down the process to the simplest form there are a ton of steps involved in bringing a t-shirt to life. Each step requires labor, time and of course money. The setup process is truly the most expensive part of screen printing. Once a press is setup and ready to go it really doesn’t make that much of a difference if you are running 50 tees or 500 tees. When you increase your total quantity it allows the screen printer to eat up a lot of their overhead cost. This is why you get a much better price break when going with a larger quantity of tees! As you can see without even looking at the individual costs for screens, films, ink, labor, and the tee itself making just one t-shirt as a sample is an extremely expensive and time consuming operation to pull off! Remember it is called the “Screen Printing Process”, and it is indeed a process. 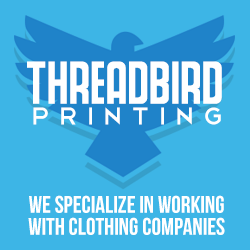 There is however a bright side when printing with Threadbird, you are provided a photo-realistic example of how your tees will turn out! While of course nothing ever beats having the real thing in hand, having a photo-realistic mock really helps a client and printer get on the same page as far as placement, size and color. Whenever you are printing make sure that your screen printer always provides you with a mock up before they go to print. So the next time your screen printer tells you that they can not print you a sample, just know that it is nothing personal it is just all apart of the process. Awesome article. I hate delivering this kind of bad news to potential customers but it just doesn’t make fiscal sense. Great article, as some one who has worked in screen printing in a high volume shop and out of my home for fun. you would be surprised as how many people want a sample print. at the high volume shop maybe 2 or 3 clients would get samples printed first, but their orders were HUGE. also in certain cases where we did a sample print we left the design up and charged per hour waiting to hear back for approval. I always use a direct-to-garment printer to make “samples” of certain designs. It is not ideal as screen printing looks much better. It is, however, great because direct to garment printing has not minimums. My guy in MA even can do DTG on black and other dark colored shirts! This information is good, it is very useful for all users of printers. There are many uses of the device, many used the printer for this purpose. Thank you for this information. Great article on screen printing. It can help a lot to newcomers who don’t know about screen printing but does a research about it.